In the early period of its television ministry, Herald of Truth utilized a variety of talent for programming. 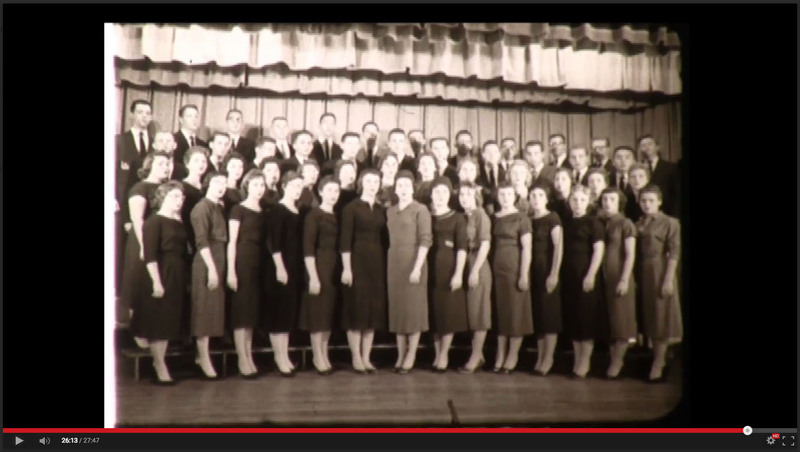 Rather than filming a single regular speaker in a studio, they filmed many television programs on location in the Sunday assemblies of Churches of Christ across the United States. While these programs focused on the sermon as delivered by the minister of the host congregation, they included singing, prayers, scripture readings and some information about the particular congregation or speaker for the week. 16mm film canister with label, Herald of Truth Television Film #65. Center for Restoration Studies, Milliken Special Collections, Abilene Christian University, Abilene, TX. Closing program panel, Herald of Truth Television Film #65. Center for Restoration Studies, Milliken Special Collections, Abilene Christian University, Abilene, TX. An early film, program 65 was shot at Freed-Hardeman College (now University) in Henderson, Tennessee on November 20-21, 1958. 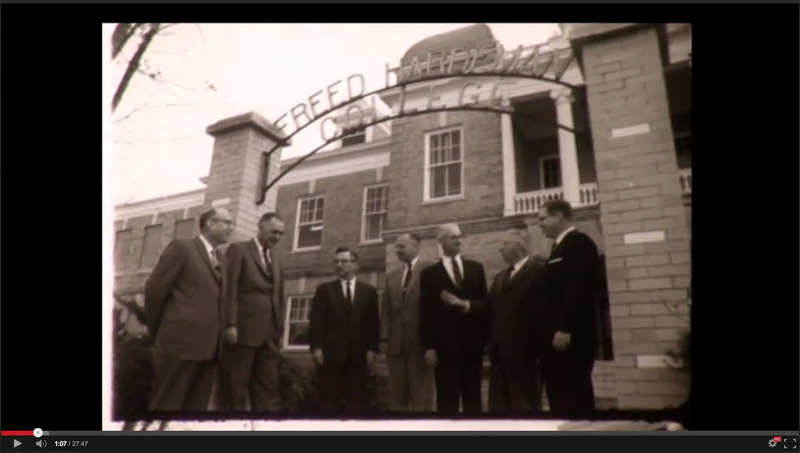 It describes aspects of the educational philosophy at Freed-Hardeman, showcases some campus facilities, and introduces well-known campus personnel, notably Hubert Allen Dixon (President), E. Claude Gardner (Dean), Willie Claude Hall, Clifford Paul Roland and Olan Hicks (Professors of Bible), Kelley B. Doyle (Chairman, Department of Music) and Frank Van Dyke (Chairman, Department of Bible). The program is just under twenty-eight minutes in length. 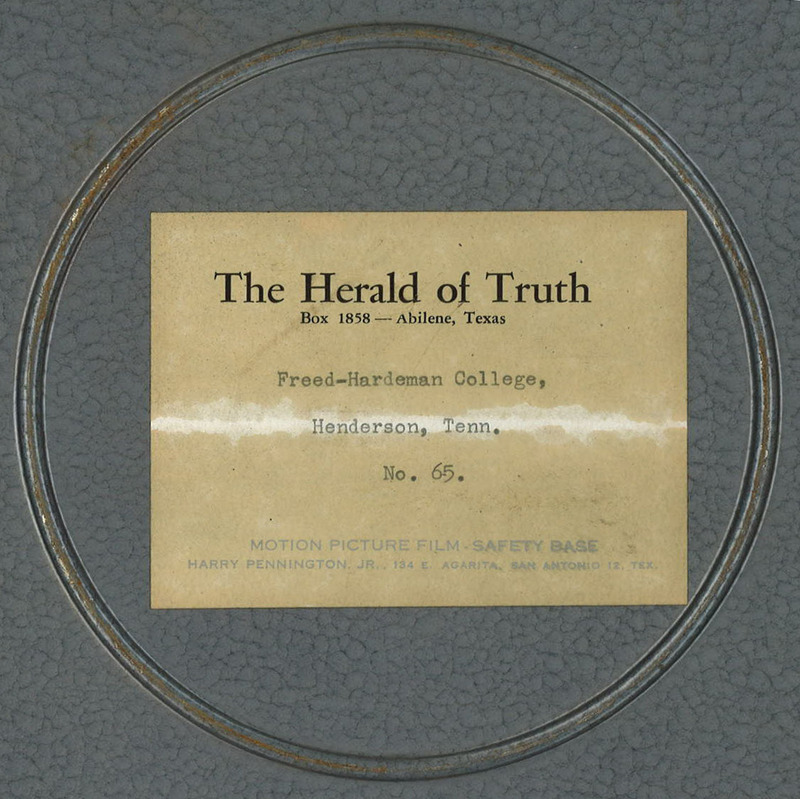 Old Main, Freed-Hardeman College, November 20-21, 1958; Herald of Truth Television Film #65. Center for Restoration Studies, Milliken Special Collections, Abilene Christian University, Abilene, TX. 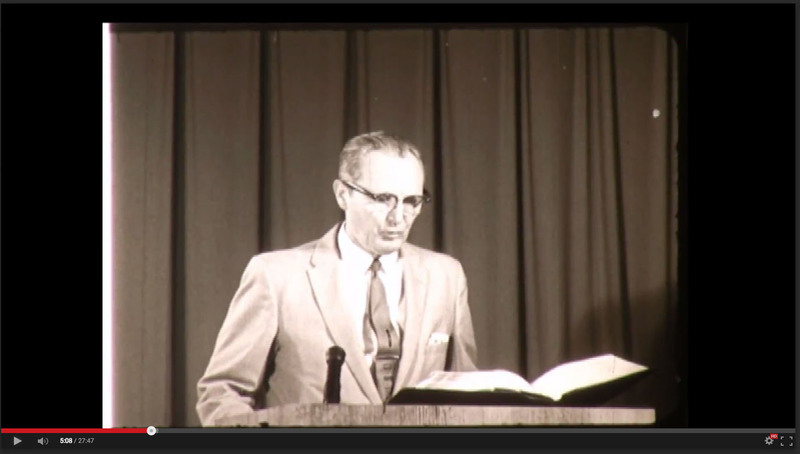 Bible Faculty, Freed-Hardeman College, November 20-21, 1958; Herald of Truth Television Film #65. Center for Restoration Studies, Milliken Special Collections, Abilene Christian University, Abilene, TX. 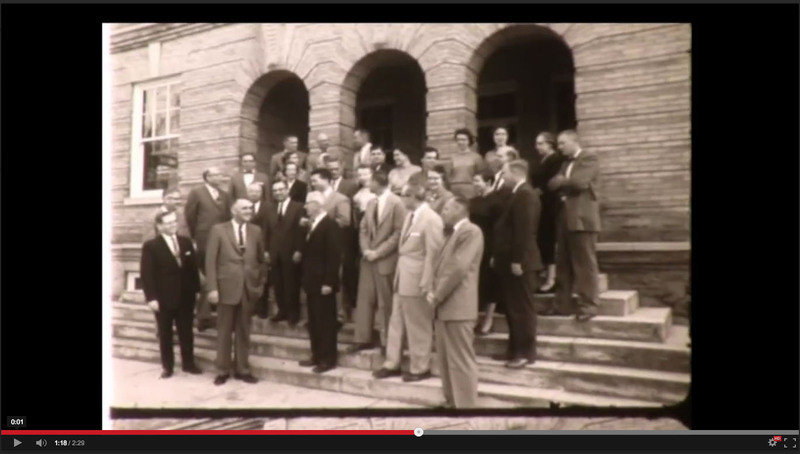 Faculty, Freed-Hardeman College, November 20-21, 1958; Herald of Truth Television Film #65. Center for Restoration Studies, Milliken Special Collections, Abilene Christian University, Abilene, TX. The speaker for the chapel program is President H. A. Dixon. His topic is “Youth Problems: Causes and Cures.” Filmed in historic Chapel Hall inside Old Main Administration Building, the program includes singing, a Bible reading, a prayer, and Dixon’s speech. 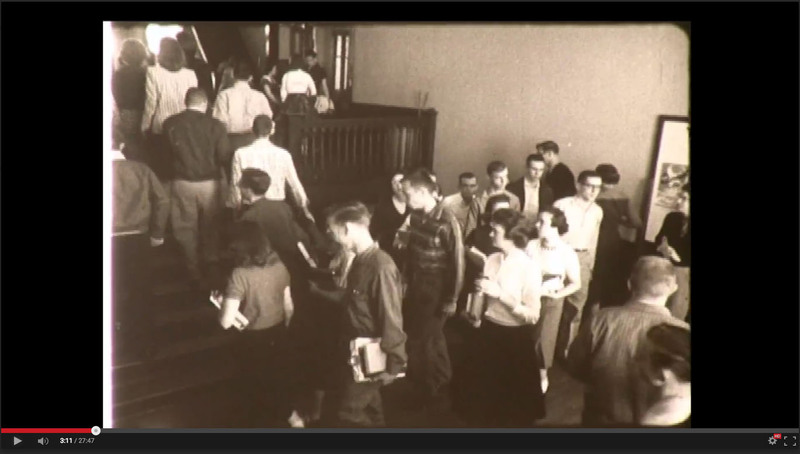 Student body in Old Main, Freed-Hardeman College, November 20-21, 1958; Herald of Truth Television Film #65. Center for Restoration Studies, Milliken Special Collections, Abilene Christian University, Abilene, TX. 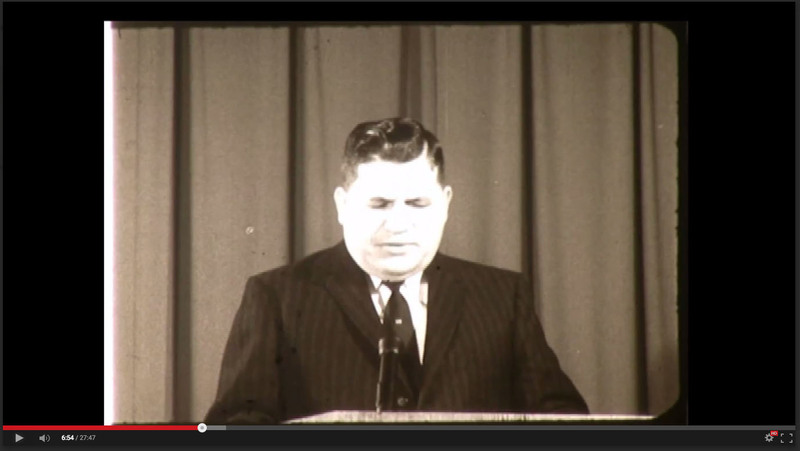 E. Claude Gardner, Freed-Hardeman College, November 20-21, 1958; Herald of Truth Television Film #65. Center for Restoration Studies, Milliken Special Collections, Abilene Christian University, Abilene, TX. Kelley B. Doyle, Freed-Hardeman College, November 20-21, 1958; Herald of Truth Television Film #65. Center for Restoration Studies, Milliken Special Collections, Abilene Christian University, Abilene, TX. 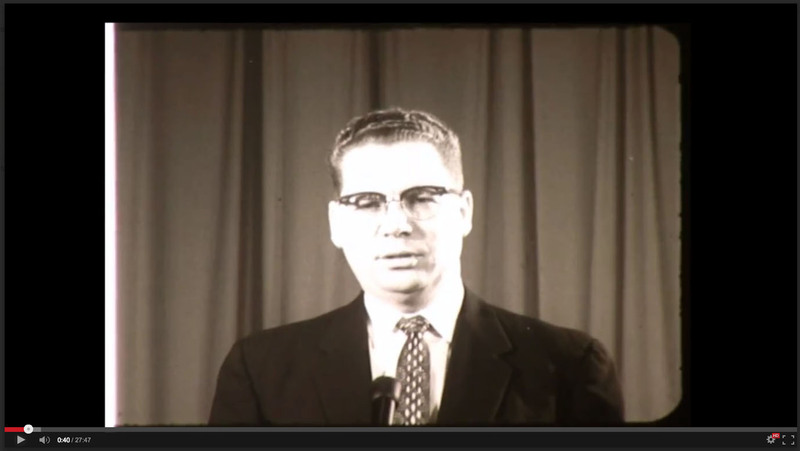 Olan Hicks, Freed-Hardeman College, November 20-21, 1958; Herald of Truth Television Film #65. Center for Restoration Studies, Milliken Special Collections, Abilene Christian University, Abilene, TX. Frank Van Dyke, Freed-Hardeman College, November 20-21, 1958; Herald of Truth Television Film #65. Center for Restoration Studies, Milliken Special Collections, Abilene Christian University, Abilene, TX. 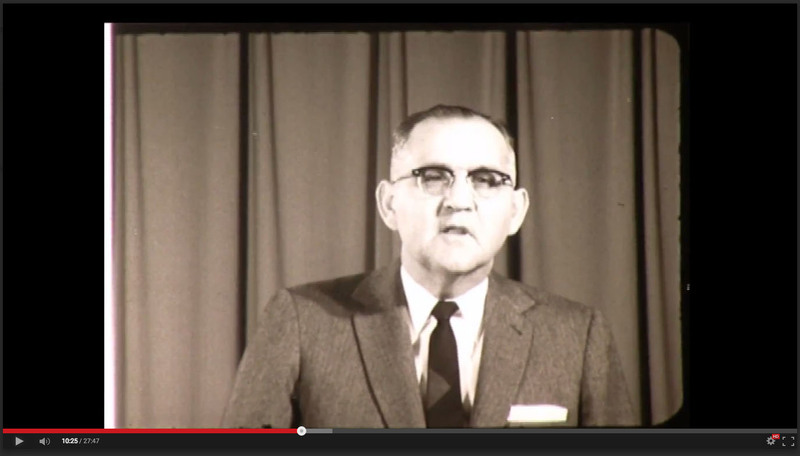 H. A. Dixon, President of Freed-Hardeman College, November 20-21, 1958; Herald of Truth Television Film #65. Center for Restoration Studies, Milliken Special Collections, Abilene Christian University, Abilene, TX. This film was digitized by Special Collections staff Donald Simpson, Becca Kello and Mac Ice as part of a larger project involving full archival processing of the Herald of Truth archives. Comprised of about 500 linear feet of paper-based files (correspondence, administrative records, scripts, ephemera and photographs), audio reels (for radio broadcast) and film reels (for television broadcast), the collection documents over fifty years’ activity of this ministry beginning in 1952 when Abilene’s Highland Church of Christ assumed leadership. The processing of these analog files and their digitization renders this radio and television programming available again, but on a much wider scale than was available to the nation-wide ministry in the 1950’s and 1960s. The original radio and television programming aired once and while listeners could (and did) request transcripts, the momentary nature of the broadcast medium meant that if you missed the program you could only read the transcript. Once this digital archive is available, listeners and viewers around the world will be able–for the first time in decades– to hear radio broadcasts, see television programming, and read scripts on-demand, over and over, at no cost. Chorus, Freed-Hardeman College, November 20-21, 1958; Herald of Truth Television Film #65. Center for Restoration Studies, Milliken Special Collections, Abilene Christian University, Abilene, TX. We will host the scans of the scripts and photographs, as well as digital versions of the audio and film reels, online for free access. Site construction is still underway, the archival processing is nearing completion and the digitization process is ongoing. So, until we have everything in place, we will share items here on this blog. 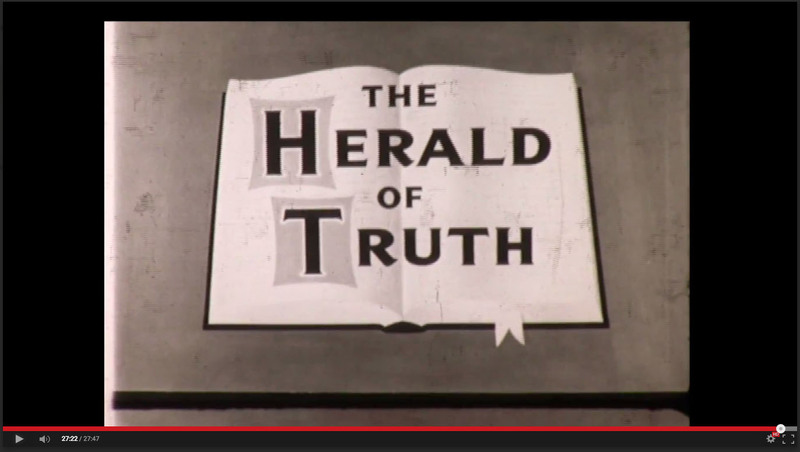 Click here to see Herald of Truth Television Film 65. 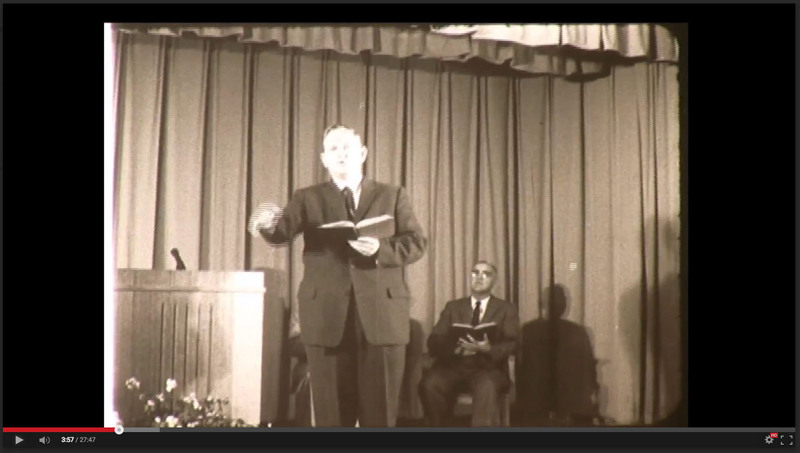 Available are the digitized 28-minute 16mm film, production notes and a script of H. A. Dixon’s chapel address. We make these materials available, including download, at no cost with the stipulation that they are not to be reproduced (including online) without permission of Abilene Christian University. This is still a work in progress; we will have a full statement of rights and permissions (we will use CreativeCommons) when the final digital archive is available. As always, check back often to see what is new. Feel free to comment below with your memories of Herald of Truth radio or television programming. Should you have any difficulty accessing or viewing any item, contact me directly at mac.ice@acu.edu. 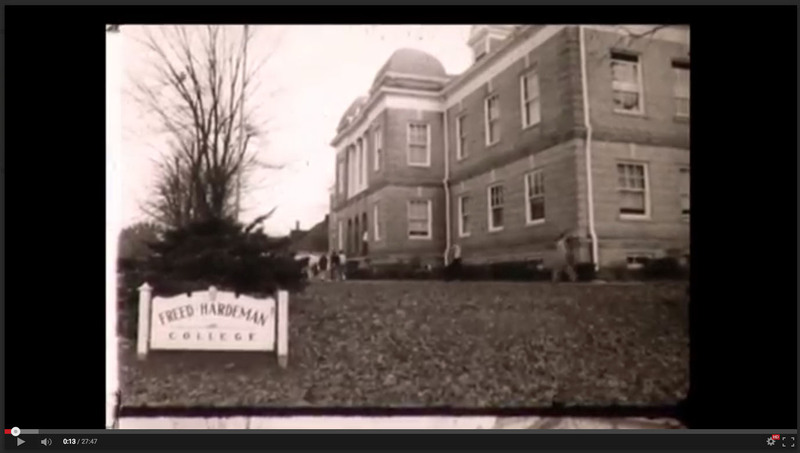 Visit Freed-Hardeman University Archives and Special Collections to learn more about their history.